I love the smell of break baking and it is a great activity for a cold, snowy day. 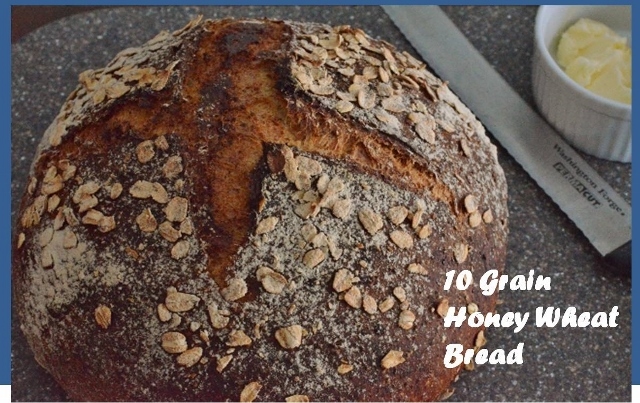 This recipe is unusual in that after the bread rises, you knead in honey. 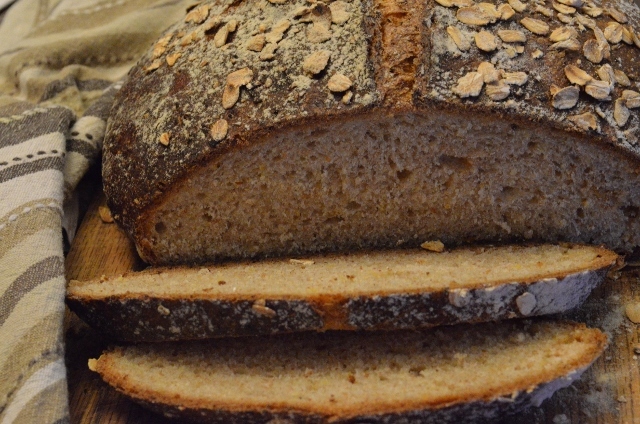 I changed to original to cook the bread in a hot cast-iron pot rather than regular bread pan and it worked great. 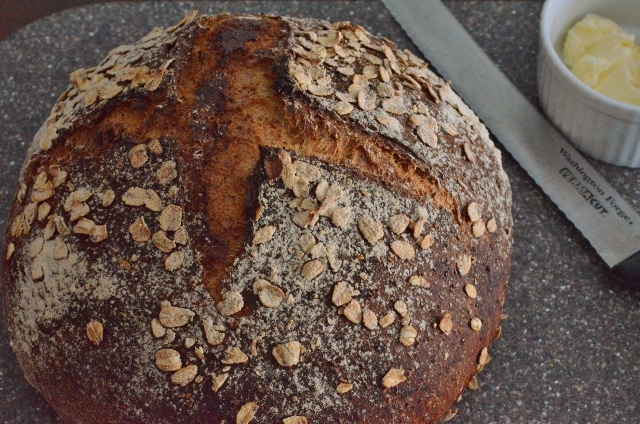 Give it a try if you enjoy bread making too! In a large mixing bowl, put flour, sugar, and salt and mix well. Using a wooden spoon, make a small well in the center of this mixture. Add the yeast, eggs, oil, and cereal to the well, and stir together until it starts to form into a bowl and becomes too difficult to mix with wooden spoon. If using stand mixer, add dough hook and knead 8 minutes. Remove from bowl and place on floured surface and knead by hand for another 10 minutes. Add small amounts of flour as needed until no longer sticky. Put a tablespoon of oil in a bowl and rub it around the entire bowl. Place the dough ball into the bowl, and flip a few times to coat in oil. Cover and let rise about 45 minutes in a warm place, or until doubled in size. (My house was not very warm and I doubled rising time). Once dough has doubled, punch the dough down and place on kneading surface again. Pour ½ cup of honey on top. The dough will be very sticky, but knead it for about five minutes, until the honey has been incorporated and it is in a nice, round ball again. Place ball on a large piece of parchment paper which has been lightly floured. Cover and let rise until doubled for about 45 minutes (or longer). While the dough is rising, preheat oven to 450 degrees and place a cast iron pot and lid in oven to heat. Once dough has doubled in size, spray lightly with water, and sprinkle with oats. Remove hot pot from oven and sit on heat-proof surface. Pick up the ball of dough by the edges of the parchment paper and place in hot pot. Quickly cut excess parchment paper and place hot lid on pot. Return to oven. With the lid on the pot, bake at 450 degrees for 30 minutes Remove the lid and continue to bake for another 10 minutes or until nicely browned. Remove from oven slide the hot bread from the pots and allow to cool. Enjoy!